Kor-Pak offers a diverse array of molded and rigid friction products which are successfully used in numerous applications. We offer custom fabricated parts as well as molding high volume products to achieve economies of scale. Kor-Pak offers Molded Flat Sheet Products available in sizes and thickness for user fabrication into any desired shape. Quick turnaround of production assures availability in either 20″x 20″ or 30″x 30″ flat sheets in wide range of available friction levels. 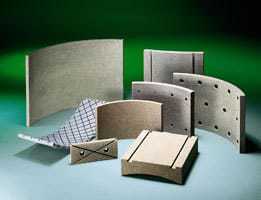 Material can either be machined or fabricated by water-jet cutting to desired shape. Non-asbestos rigid molded blocks are the premium product line for use on heavy duty industrial brakes and shoe type clutches. RF materials exhibit smooth consistent friction with excellent properties. Kor-Pak manufactures a wide variety of industry standard gear-tooth facings used in power transmission applications such as PTOs and industrial clutches, both disc type and constrictor. They are available in mid-co and hi-co materials as well as specialty materials developed for water-cooled applications and a hi-strength “Kevlar” material. Kor-Pak offers a variety of facings to meet the most severe oilfield and industrial applications. Both ID and OD geartooth facings are produced in either RF38 standard duty medium friction material and in RF52 high strength high torque material, but upon request can be molded in most Kor-Pak materials. The clutch insulator plates are molded from a specially developed non-metallic formulation which exhibits excellent insulating properties while presenting a smooth tough surface in your critical clutch applications. Cathead facings are available in standard manufacturer configurations , in either an RF formulation or GGW woven material and can be readily cross-referenced by a Kor-Pak technical representative. Perhaps Kor-Pak’s most distinct value proposition lies in its adept ability to design and manufacture custom value-added Molded & Rigid Friction Materials Products. 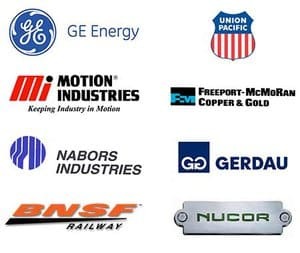 For example, Kor-Pak has successfully produced Brake Pads for passenger rail cars, Brake Band Assemblies for agricultural equipment, and Clutch Facings for the Oil Industry. Kor-Pak’s experience and selection, combined with laser cutting and machining/fabrication capabilities allow for the ability to produce high-quality custom products to suit a unique application while concurrently offering competitive pricing and quick turnaround. Kor-Pak has been a distributor for Scan-Pac Manufacturing friction and wear materials for multiple decades and it began in the early 1980’s when Kor-Pak and Scan-Pac created a robust synergy to pioneer non-asbestos friction materials into the industrial world. Today, these companies continue to work together and stay at the cutting edge of friction and phenolic materials to create the best in industrial brake and clutch applications. Kor-Pak and Scan-Pac provide the best in organic friction linings for Industrial Braking Systems and have been proven to outlast competing products. OEM’s use Scan-Pac Friction materials and refuse to compromise when it comes to quality and performance.